Today I am doing something a little different. I am going to showcase some fashion for your viewing pleasure. Since Halloween is my favorite holiday, I figured I would show off a few ways I would dress the week leading up to Halloween. 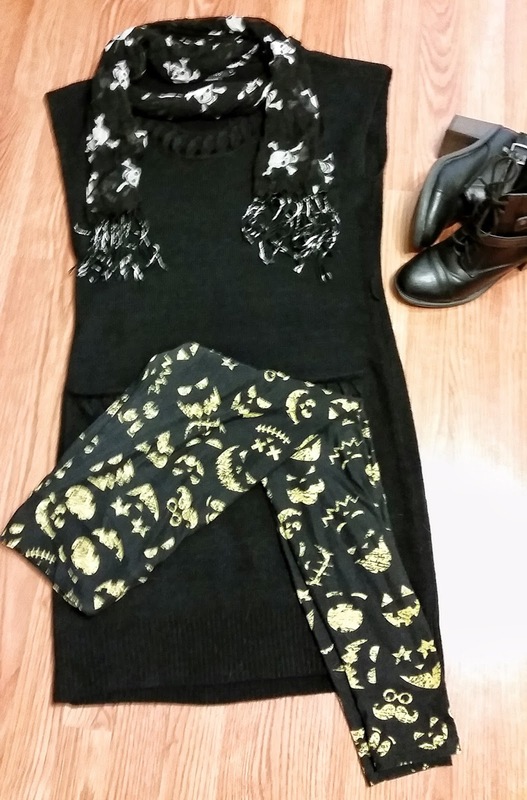 I am going to show you two looks involving wearing skulls. Now I know some people are not a huge fan, so I went one for the girl who doesn't mind wearing black, and one for the gal who adores her pinks. 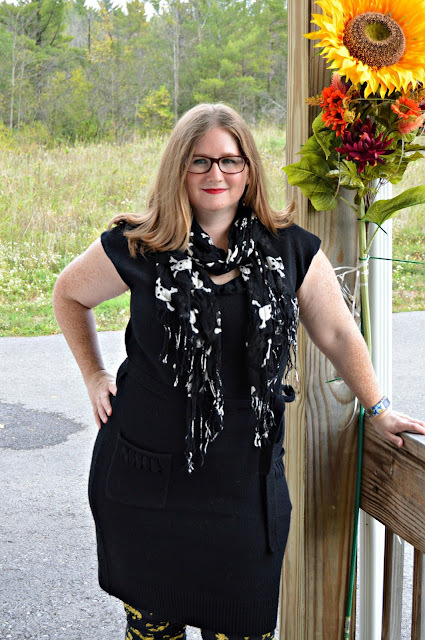 The first look incorporates a black sweater dress with some fun Halloween leggings. I added the skull accent with a scarf and finishing off the look with some ankle boots and a red lip. This is a look I would wear to the office for Halloween. The black sweater dress was found brand new on Thred Up. If you aren't using Thred Up you are missing some great deals. I have provided my referral link. You get $10 when you sign up with my link! The scarf was a find at the local thrift shop. 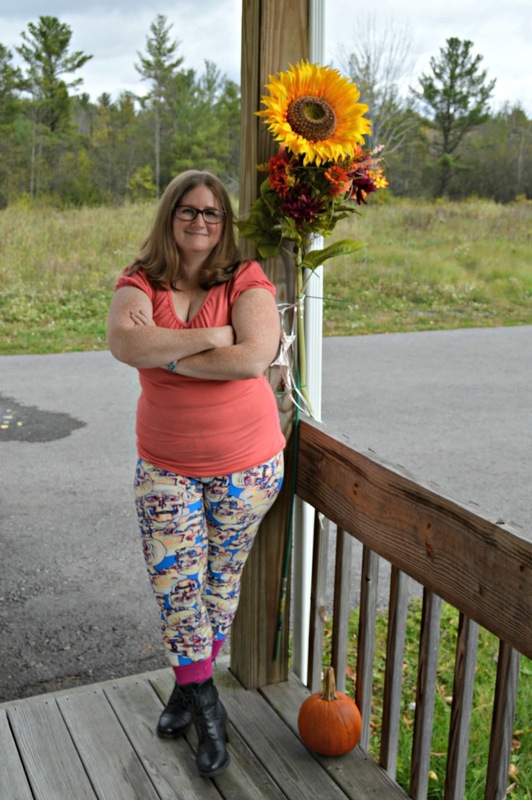 These leggings are my new favorites! They are from the LulaRoe Halloween capsule. They are a fun addition to any dress or tunic this time of year. The next look is a little more for the girly girl who isn't much for black. 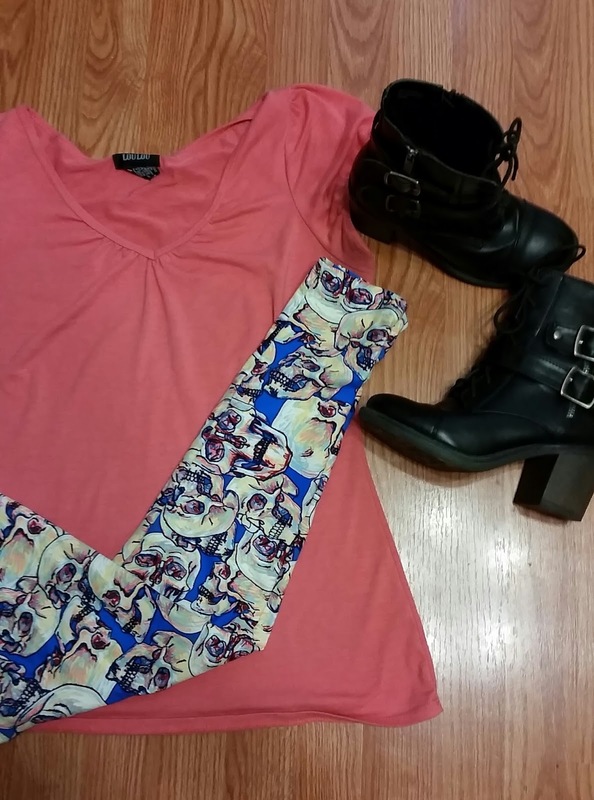 I paired a salmon pink top which was thrifted and a pair of fun skull leggings from the LulaRow Halloween capsule. The outfit is tied together with some bright magenta socks and ankle boots. I had a blast putting together these outfits and shooting my first photoshoot for this blog. The weather has been pretty dreary here in NY the last few days, so I was happy to get a dry day to model these outfits while it was still Fall looking outside. Notice my porch is a little decorated for fall.. those flowers were parking markers from our wedding! I thought it was fun to attach them to the porch for a festive look. Stay tuned for some more fun outfits coming your way! I am thinking about doing something weekly because, why not? !